If your boat is overpowered, it is slower because it is heeling too much. Excess heeling increases leeway and reduces the efficiency of your boat’s keel and rudder. The boat goes slower because the rudder is fighting increased weather helm. To get the boat back under control, sail area has to be reduced. There are two options for reducing sail area: change to a smaller genoa or reduce the size of the main by reefing. In around the buoys racing you can always change to a smaller genoa at the next turning mark and until that happens then just flog the main in the over-powering gusts for the one or two-mile upwind legs. In a distance race you’ll end up with a ripped main if you flog it too much. When the next turning mark is hours or days away, reefing the main is the quickest and simplest way to reduce sail. A well set up boat can have two people tuck in a reef in a minute or two, compared to waking up the other watch to change genoas. Photo 1: Notice how tight the reefed foot is. Just the normal outhaul gets pulled tight when he breeze it up to flatten the main, the reef outhaul has to be tight to flatten the sail. To get the most benefit from a mainsail area reduction (reefing), make sure that the reef outhaul and halyard are tensioned tight – bar tight. If those controls are loose, the sail will become too full, and full sails make you heel more when the wind is howling. 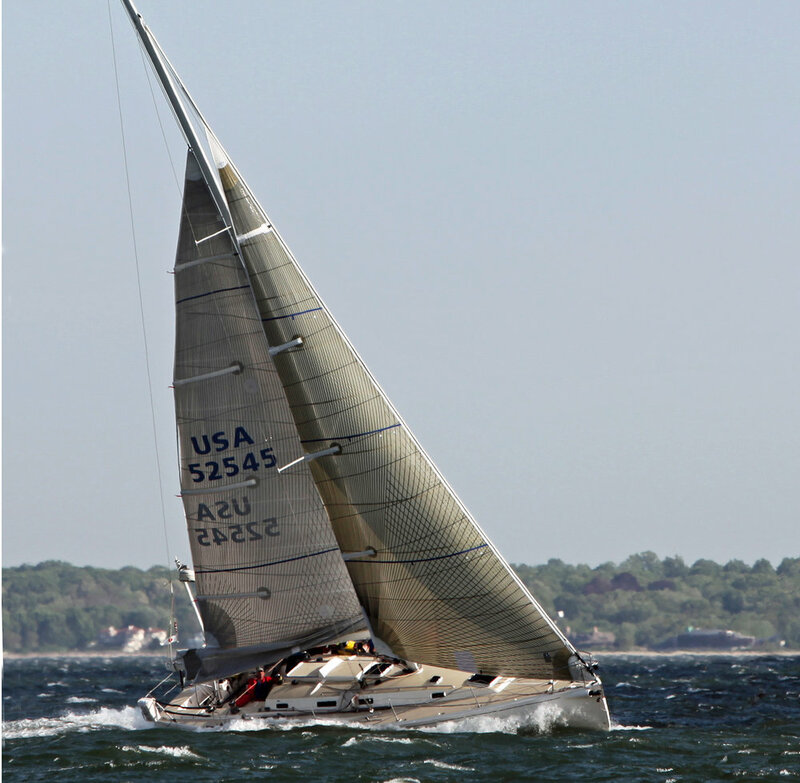 Notice how flat the foot of sail is in Photo 1 of Soulmates. Properly built sails are reinforced to take these strains. In one race I sailed, we had the second reef in the main for 24 hours as we sailed through the remains of a hurricane. When we shook the reef, there was no deformation of the sail. That reef outhaul was cranked on TIGHT as we blasted through winds that grew from 30 knots at the start to 48 knots. So go ahead, winch the reef outhaul hard. 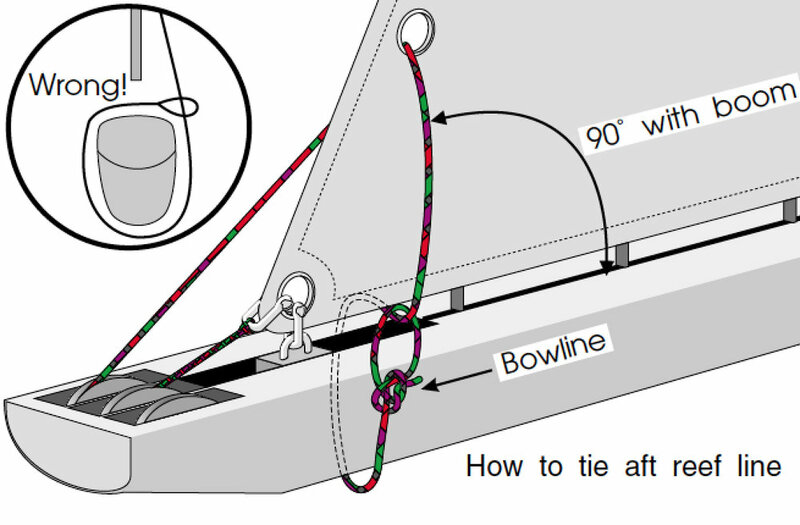 Diagram 1: How to tie off a reef line. Before describing how to put in a reef, you need to rig the reef outhaul correctly so that when you tighten it, the reef clew is pulled aft and down. The diagram shows the proper way to rig the reef line. Pull it from the end of the boom, up to the reef clew, down over the boom and under the foot of sail, under the boom and end it with a bowline around the part of the reef line coming down from the reef clew. Photo 2: Reef hooks, also called reef horns. To put in a reef, drop the main halyard far enough to set the reef tack. This is when things can get dicey if your sail has a bolt rope instead of slides because the mainsail luff has to come out of the mast as you lower it. In a lot of wind, controlling the loose sail can be difficult. Most boats have reef hooks on each side of the boom that catch the reef tack (Photo 2). You have to lower the mainsail enough to get the reef tack’s ring onto the hook. Once the reef tack is made, the halyard is re hoisted -- very tight. Next, pull and winch the reef outhaul tight. Remember to ease the mainsheet and vang or else you will not be able to get the reef outhaul tight enough. The reef outhaul is tight enough when the reef clew is down to the boom and the mainsail foot is pulled straight between the reef tack and reef clew. Photo 3: The reef tack his held by the white Dyneema line that comes from a padeye on the far side of the mast, through the reef tack grommet where it snaps into place on the padeye located below the black measurement band. Standing on the cabin top with the mainsail flogging makes it hard to get the reef tack onto the hook, and if the halyard does not get tensioned quickly, the tack can flog off the hook. A more secure method is shown in Photo 3. It involves a piece of low-stretch line that is attached to a pad eye on the mast with a snap shackle on the end. 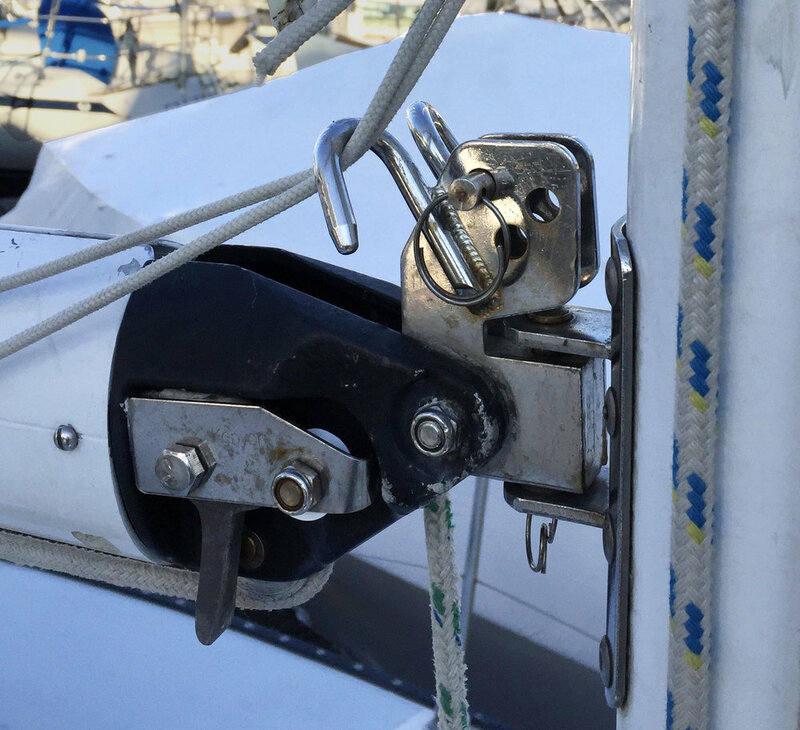 To set the reef tack, pass the shackle through the reef tack grommet and then down to the pad eye on the opposite side of the mast. This method ensures that the reef tack is securely held in place. In the photo, the top of the strop for the second reef can just be seen on the pad eye. Once the reef tack and clew have been set, there is loose sail that needs to be controlled. Just roll up the sail parallel to the boom and tie it in place with bungee cord. If you use a piece of line or a sail tie, you risk ripping the sail by shaking the reef with the ties still in place. This happens a lot at night. Sail ties can work well, because they are very visible and hard to miss when it is time to shake out the reef, see Photo 4. Some sails do not have the grommets (reef diamonds) between the reef tack and clew at the first reef because there is not enough sail loose to worry about. Adam Loory is the General Manager of UK Sailmakers International. He has tens of thousands of ocean miles that include cruising nearly halfway around the world and racing six Newport to Bermuda Races and the 2017 Sydney Hobart Race.